We launched Google Public DNS three years ago to help make the Internet faster and more secure. Today, we are taking a major step towards this security goal: we now fully support DNSSEC (Domain Name System Security Extensions) validation on our Google Public DNS resolvers. Previously, we accepted and forwarded DNSSEC-formatted messages but did not perform validation. With this new security feature, we can better protect people from DNS-based attacks and make DNS more secure overall by identifying and rejecting invalid responses from DNSSEC-protected domains. DNS translates human-readable domain names into IP addresses so that they are accessible by computers. Despite its critical role in Internet applications, the lack of security protection for DNS up to this point meant that a significantly large portion of today’s Internet attacks target the name resolution process, attempting to return the IP addresses of malicious websites to DNS queries. Probably the most common DNS attack is DNS cache poisoning, which tries to “pollute” the cache of DNS resolvers (such as Google Public DNS or those provided by most ISPs) by injecting spoofed responses to upstream DNS queries. To counter cache poisoning attacks, resolvers must be able to verify the authenticity of the response. DNSSEC solves the problem by authenticating DNS responses using digital signatures and public key cryptography. Each DNS zone maintains a set of private/public key pairs, and for each DNS record, a unique digital signature is generated and encrypted using the private key. The corresponding public key is then authenticated via a chain of trust by keys of upper-level zones. DNSSEC effectively prevents response tampering because in practice, signatures are almost impossible to forge without access to private keys. Also, the resolvers will reject responses without correct signatures. DNSSEC is a critical step towards securing the Internet. By validating data origin and data integrity, DNSSEC complements other Internet security mechanisms, such as SSL. It is worth noting that although we have used web access in the examples above, DNS infrastructure is widely used in many other Internet applications, including email. Currently Google Public DNS is serving more than 130 billion DNS queries on average (peaking at 150 billion) from more than 70 million unique IP addresses each day. However, only 7% of queries from the client side are DNSSEC-enabled (about 3% requesting validation and 4% requesting DNSSEC data but no validation) and about 1% of DNS responses from the name server side are signed. Overall, DNSSEC is still at an early stage and we hope that our support will help expedite its deployment. Effective deployment of DNSSEC requires action from both DNS resolvers and authoritative name servers. Resolvers, especially those of ISPs and other public resolvers, need to start validating DNS responses. Meanwhile, domain owners have to sign their domains. Today, about 1/3 of top-level domains have been signed, but most second-level domains remain unsigned. We encourage all involved parties to push DNSSEC deployment and further protect Internet users from DNS-based network intrusions. For more information about Google Public DNS, please visit: https://developers.google.com/speed/public-dns. In particular, more details about our DNSSEC support can be found in the FAQ and Security pages. Additionally, general specifications of the DNSSEC standard can be found in RFCs 4033, 4034, 4035, and 5155. Update March 21: We've been listening to your questions and would like to clarify that validation is not yet enabled for non-DNSSEC aware clients. As a first step, we launched DNSSEC validation as an opt-in feature and will only perform validation if clients explicitly request it. We're going to work to minimize the impact of any DNSSEC misconfigurations that could cause connection breakages before we enable validation by default for all clients that have not explicitly opted out. Update May 6: We've enabled DNSSEC validation by default. That means all clients are now protected and responses to all queries will be validated unless clients explicitly opt out. We created a new Help for hacked sites informational series to help all levels of site owners understand how they can recover their hacked site. The series includes over a dozen articles and 80+ minutes of informational videos—from the basics of what it means for a site to be hacked to diagnosing specific malware infection types. 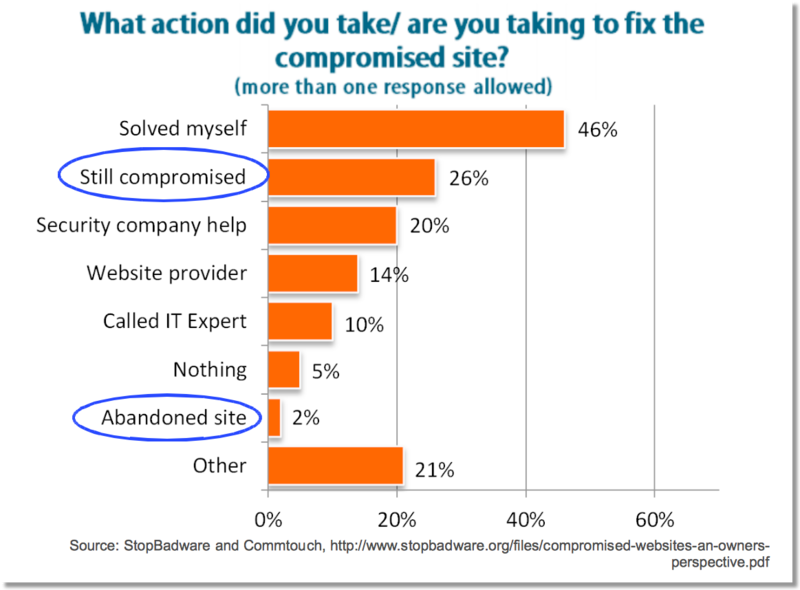 In StopBadware and Commtouch’s 2012 survey of more than 600 webmasters of hacked sites, 26% of site owners reported that their site was still compromised while 2% completely abandoned their site. We hope that by adding our educational resources to the great tools and information already available from the security community, more hacked sites can restore their unique content and make it safely available to users. The fact remains, however, that the process to recovery requires fairly advanced system administrator skills and knowledge of source code. 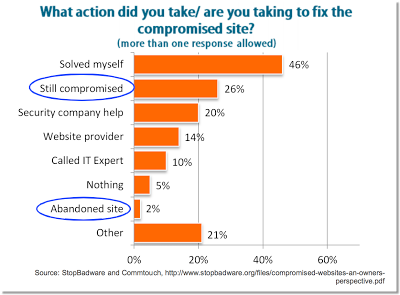 Without help from others—perhaps their hoster or a trusted expert—many site owners may still struggle to recover. Cybercriminals employ various tricks to avoid the site owner’s detection, making recovery difficult for the average site owner. One technique is adding “hidden text” to the site’s page so users don’t see the damage, but search engines still process the content. Often the case for sites hacked with spam, hackers abuse a good site to help their site (commonly pharmaceutical or poker sites) rank in search results. Both pages are the same, but the page on the right highlights the “hidden text”—in this case, white text on a white background. As explained in Step 5: Assess the damage (hacked with spam), hackers employ these types of tricks to avoid human detection. In cases of sites hacked to distribute malware, Google provides verified site owners with a sample of infected URLs, often with their malware infection type, such as Server configuration (using the server’s configuration file to redirect users to malicious content). In Help for hacked sites, Lucas Ballard, a software engineer on our Safe Browsing team, explains how to locate and clean this malware infection type. Lucas Ballard covers the malware infection type Server configuration.